Manila, Philippines - If you think burger is only for yummy patty, now it's time to change your perceptions. Incredible revamped burger taste makes even more better, 'Three Guys and Grill' offers lobster burgers and hotdog sandwiches. You definitely can't go wrong with this new kind of experience. 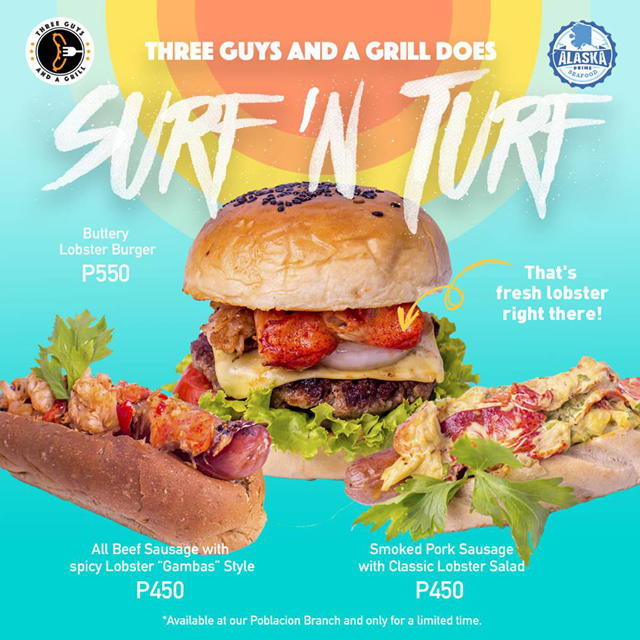 Here are the available lobster menu, available for a limited time only: There's the Buttery Lobster Burger (P550) which has a huge juicy lobster chunks combined with tender beef patty, tomatoes, onions, lettuce, and cheese between two soft buns. Smoked Pork Sausage With Classic Lobster Salad (450), and All Beef Sausage With Spicy Lobster "Gambas" Style (P450). You can visit Three Guys and a Grill in 4364 B. Valdez Street, Poblacion, Makati City.